Secretary of State Rex Tillerson carried a unified message from world powers to Moscow on Tuesday, denouncing Russian support for Syria and taking up America’s traditional role as leader of the West on behalf of Donald Trump’s administration. Tillerson took off for Russia on Tuesday from Italy, where he met foreign ministers from the Group of Seven advanced economies. They were joined by Middle East allies to forge a united position on Syria, which has been catapulted to the top of the international agenda since a poison gas attack killed 87 people a week ago. Western countries blame Syrian President Bashar al-Assad for the gas attack, and Trump responded by firing cruise missiles at a Syrian air base. That has put his administration in open dispute with Russian President Vladimir Putin, who has stood firmly by Moscow’s ally Assad, who denies blame. He said Russia had failed in its role as sponsor of a 2013 deal under which Assad promised to give up his chemical arsenal. In a statement released before Tillerson was due to arrive, Russia said it hoped its meetings with him would be productive but it was concerned about a number of areas of U.S. policy, including on North Korea, Libya and Yemen as well as Syria. The secretary of state’s role as messenger for a united G7 position is a turning point for Trump, who in the past alarmed allies by voicing scepticism about the value of U.S. support for traditional friends, while calling for closer ties with Moscow. Tillerson himself is a former boss of the Exxon Mobil oil company which has gigantic projects in Russia. He was awarded Russia’s “Order of Friendship” by Putin in 2013. He is due to meet Russian Foreign Minister Sergei Lavrov in Moscow on Wednesday. The Kremlin has said Tillerson would not meet Putin during this trip, although some Russian media have reported that such a meeting may nevertheless take place. On Monday, Trump discussed Syria by telephone with British Prime Minister Theresa May and German Chancellor Angela Merkel. “I think we have to show a united position and that in these negotiations we should do all we can to get Russia out of Assad’s corner, at least to the point that they are ready to participate in finding a political solution,” German Foreign Minister Sigmar Gabriel said on Monday. Britain and Canada said financial sanctions, imposed on Russia in 2014 over its annexation of territory from Ukraine, could be tightened if Moscow continued to back Assad, although France said this was not discussed deeply at the G7 meeting. Multi-billion dollar Russian oil projects by Exxon are among the biggest deals held up by sanctions. Western countries have been calling for Assad to leave power since 2011, the start of a civil war that has killed at least 400,000 people and created the world’s worst refugee crisis. Assad’s position on the battlefield has become far stronger since Russia joined the war in support of him in 2015. The United States and its allies are conducting air strikes in Syria against Islamic State, but until last week Washington had avoided targeting forces of Assad’s government directly. The United States said its strike on the Syrian airbase near Homs on Friday was a one-off, and not a strategic shift. But the White House has also said Trump could authorise more strikes if Syria uses chemical weapons again. White House spokesman Sean Spicer suggested on Monday that there could be a lower bar for further U.S. action, saying Washington could also retaliate if Syria uses “barrel bombs” – oil drums packed with explosives dropped from aircraft. Retaliating for barrel bombs would require a major shift in U.S. policy since rebels say the weapons are used almost daily. The Syrian Observatory for Human Rights, a British-based monitoring group, said Syrian warplanes dropped barrel bombs on rebel-held areas of Hama province on Tuesday. Syria has always denied using barrel bombs, though their use has been widely recorded by U.N. investigators. A source in the Syrian military denied it used them on Tuesday. Assad’s allies have been robust in standing by him. A joint command centre made up of the forces of Russia, Iran and Lebanon’s Hezbollah militia said on Sunday that the U.S. strike crossed “red lines” – the term Washington has used in the past to refer to Syria’s use of poison gas. The alliance supporting the Syrian president would respond to any new aggression and increase support for its ally, it said. The missile attack has increased expectations that Trump is ready to adopt a tougher stance with respect to Russia, and that he is ready to engage in world affairs instead of following the more isolationist position he had previously taken. Until the chemical attack, Trump had said Washington would no longer act as the world’s guardian, especially if it was not in the interests of the United States. Trump’s previous warm words for Russia were an issue at home, where intelligence agencies accuse Moscow of using computer hacking to help him win last year’s presidential election. The FBI is investigating whether Trump campaign officials colluded with Moscow, which the White House denies. On Monday, Tillerson visited the site of a World War Two Nazi massacre in Italy and said Washington would never let such abuses go unchallenged. “We rededicate ourselves to holding to account any and all who commit crimes against the innocents anywhere in the world,” Tillerson told reporters in Sant’Anna di Stazzema. U.S. Tries to Line up West, Mideast against Assad. 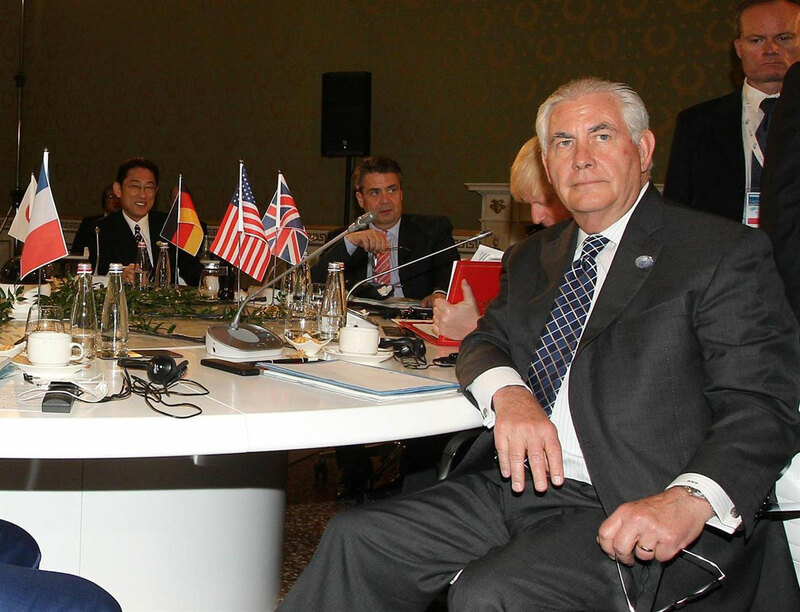 Secretary of State Rex Tillerson carried a unified message from world powers to Moscow in the G7 meeting.